Bon Vivant and a Budget: What Can I Buy for $10 in Brooklyn? What Can I Buy for $10 in Brooklyn? This weekend I wasn't planning on doing any retail therapy, but when a visiting friend wanted to explore Brooklyn, shopping became inevitable. As always, I found more than a few things I loved and had to have, but I couldn't justify buying everything in sight- especially since our economy still needs a heavy dose of Prozac... le sigh! Instead, I wandered to the nearest ATM and withdrew a crisp Alexander Hamilton and set myself a challenge budget of $10. Why $10? I did this to prove that there are cool things to be bought for a small amount of money if you know where to look (thanks to my momma for teaching me how to shop and be a Bon Vivant + a Budget). 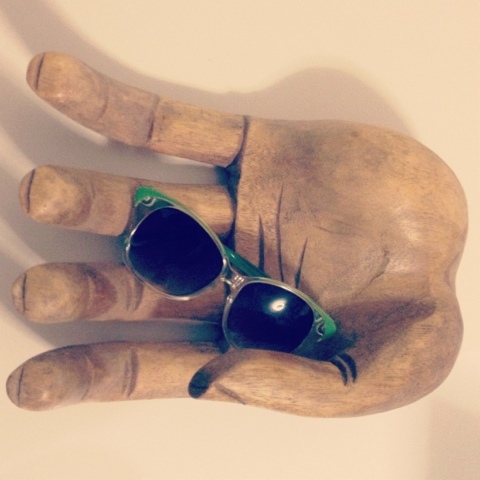 Green sunglasses for $5 from a street vendor in Ft. Greene, Brooklyn. I've been looking for some interesting sunnies for a while; these were a perfect fit and price. Cheap sunglasses are a necessity since I always lose or sit on them anyway. Vintage Bareuther flower shaped plate for 25¢. Yes, you read that right; I paid a quarter in a thrift store called Valu-Plus in Brooklyn. This pretty plate will house my frequently used lipsticks and glosses. 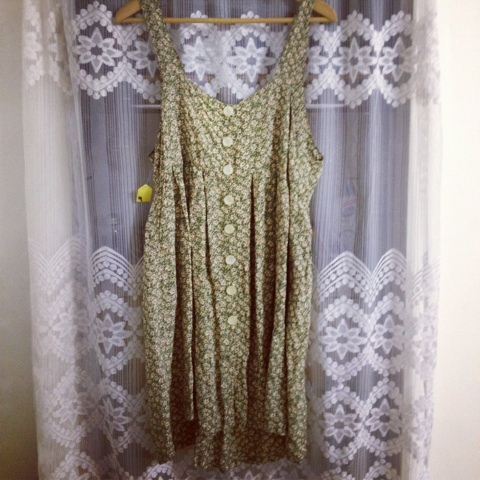 Cute floral dress for $4 at Lora's Clothing in Sunset Park, Brooklyn (this store is so off the radar, it's not even on Yelp). I already know exactly how I'm gonna wear this. I'll probably give it some edge and rock it with a big afro, some black tights and a pair of combat boots. $5 + $4 + 25¢ = a whooping grand total of $9.25!!!! My shopping craving was satiated and I was left with 75 cents change... I dun' good! What can you buy for $10? Where are your favorite places to shop when the purse strings are tight? Do you think I should turn "What can you buy for __?" into a regular feature on the blog? Nicely done Helene! I love great buys, although I've never quite put a budget on it the way you did! (-: and YES YES YES this should be a regular feature because obviously you have a knack for finding great deals on a budget. Can't wait to see what you will have in store next time around! thanks Candace! I'm glad that you enjoyed this post. Thanks girl! I will post pics when I wear it!